It is a mighty thing, this massive red-granite obelisk, lying under a scalding sky in the open-air museum that is Egypt's Aswan quarries. Some might thank the stars that Egypt's 3500-year-old Unfinished Obelisk remained unfinished, forever attached umbilically to home soil. It has meant that the legions of treasure hunters trawling the land of the pharaohs could never purloin it as they did so many of its siblings. The obelisk – an almost mythical tapered monolithic pillar topped by an electrum-plated pyramid – a mixture of gold and silver – was much desired. It was carved from a single piece of usually red granite from these legendary quarries and symbolised the strength and creative force of the sun god Ra. Just 21 ancient Egyptian obelisks still stand, but fewer than 10 remain in Egypt, including Cairo's Heliopolis Obelisk, the oldest Egyptian one still upright. We've come to Aswan for a sojourn before heading further south to Rameses the Great's massive rock temples at Abu Simbel near the Sudanese border. Strategic Aswan, once ancient Egypt's southern limit and doorway to Africa, is a place of stark beauty – no misty, fuzzy lines or diffuse light here. The Nubian Nile city boldly displays its colours as butter yellow for desert, quicksilver for the palm-fringed Nile and azure for its infinite arc of sky. This ancient capital of Upper Egypt wears its treasures of antiquity with style. There is the World Heritage-listed Philae Temple complex – the ancient temple of Isis – relocated to higher ground before the 1970 completion of the Aswan High Dam that flooded the two islands on which the temple stood. There is Elephantine Island, richly sewn with ancient shrines and temples – plus the Nilometer that measured the miraculous, life-giving flood. And then there are the great stone quarries, now recognised archaeological sites, that once yielded the superior red, grey and black granite for ancient Egypt's obelisks and many of its sarcophagi, monuments and sculptures. 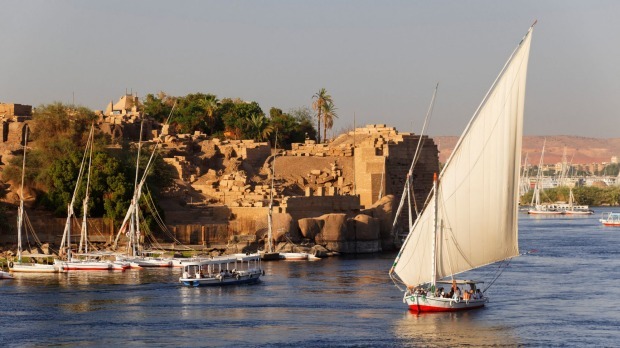 Barges transported granite blocks for the Great Giza Pyramids the 700 kilometres down the Nile from Aswan. 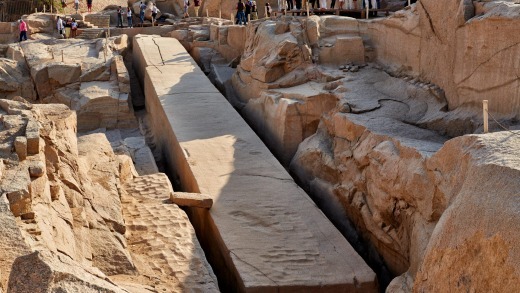 The Unfinished Obelisk lying at Aswan's Northern Quarry, about 1½ kilometres from town, provides a partial insight into how obelisks were carved and raised. Some say erecting an obelisk was more difficult than pyramid construction. There are still questions surrounding how the ancients crafted such monumental slabs of stone. The obelisk we gaze upon, which the female pharaoh Hatshepsut commissioned, measures 42 metres and weights 1090 metric tonnes – the weight of about 200 African elephants. Three sides had been completed before a fatal flaw appeared. This single heaviest piece of stone ever shaped by ancient Egyptians was abandoned, still partly attached to bedrock. One can only imagine the backbreaking efforts of workers wedged between rock, chiselling and shaping the stone. So what became of some of ancient Egypt's remaining significant standing obelisks? Rome nicked 13 during Roman times – the so-called Lateran obelisk in Piazza San Giovanni in Rome is the world's tallest standing obelisk. France has one in the Place de la Concorde, after Josephine farewelled Napoleon on his failed 1798 Egyptian conquest with the words, "If you go to Thebes, do send me a little obelisk". Or so the legend goes. The Egyptians bewilderingly gave France permission to appropriate both of Rameses the Great's guardian obelisks at Luxor Temple but only brought one back in 1831, so difficult was the task. Cleopatra's Needle – the Thutmose III obelisk acquired by the British in the 1870s, now stands on London's Victoria Embankment. Its tragic journey to the British Isles, which involved a Bay of Biscay storm and the deaths of accompanying seamen, might invoke the curse of the Pharaohs for those who believe in such things. In New York's Central Park stands the London twin, another Cleopatra's Needle, though history offers no connection to the Egyptian queen. Egypt's then ruler, the Khedive Ismail, profligate with his nation's treasures, promised this Thutmose III obelisk to the United States after the Suez Canal's 1869 opening. Those who have visited Istanbul's Hippodrome of Constantinople will have gazed upon the so-called Obelisk of Theodosius – another of Pharaoh Thutmose III's ancient obelisks that once graced the Great Temple of Karnak in ancient Thebes. The Roman emperor Theodosius had a hand in pinching this pink granite beauty. It is not to be confused with the Walled Obelisk at the other end of the Hippodrome, not of ancient Egypt, but built by a Roman emperor. Back in Aswan, those visiting the southern quarries can view a reclining mummy-shaped colossus as well as stone coffins planned for the pharaohs' successors, the Ptolemies, but never delivered to Alexandria. To touch the granite, once selected and fashioned by the creators of an intricate civilisation, is stirring indeed.